Metal maniacs, rejoice! 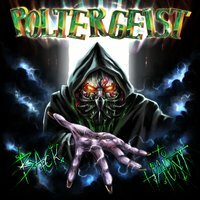 The Thrasher returns to present to you; POLTERGEIST, hailing from Swiss grounds – signed via Pure Steel records, and on their long-awaited 20+ year comeback album entitled: “Back To Haunt”. With 3 records behind them since formation of the quintet's existence in 1988: “Depression” (released in 1989), “Behind My Mask” (released in 1991), and “Nothing Lasts Forever” (released in 1993), it was about bloody time to be reunited, right? Yes. You would be right…though I have mixed feelings about quartets who disband and reunite; I can look past it when it's THIS long. After more than 20 years; we are treated with the quartet's latest endeavor: “Back To Haunt”. Now I am not at all too familiar with POLTERGEIST; being a Thrasher myself, I relish new discoveries such as this - and I can tell you with clarity that these guys mean business. Ferocious riffery that confirms the band's genre indefinitely; I am pleased to say that this resurgence was very much necessary, for the band and for Thrash Metal as a whole. It shows the band is ready to rumble and is resurrected with the sole purpose to thrash your noggins! This 4-piece band consists of V.O. Pulver on guitar who delivers some intense riffs that beg one to pound their fists; very much the same with Chasper Wanner, delivering killer riffery of the highest degree, which helps pummel the sound production with ferocity. The powerhouse manage to contribute fine precision with Sven Vormann on drums and Ralf W. Garcia on bass; everyone can be heard, which almost perfectly captures memorability, and so this helps create a rapid atmosphere while uniquely showcasing haunting elements that procreate POLTERGEIST efficiently. With complexity and dexterity, I personally sensed that this band took their time in the creation of “Back To Haunt”, composing with compassion to bring the community their most brutal and deadliest record in their catalogue. 10 intense tracks of thrashing mayhem; edging with an 11th bonus track from the Limited Edition version. Ranging at around an hour long…the titular track “Back To Haunt” thus begins the record; in pleasurable awe I enter into a sound production that literally all Metal bands should take note if you want to gain that merit. Not just sound production; also showcasing musicianship of aptitude skill. “Gone And Forgotten”, “Patterns In The Sky” & “And So It Has Begun” integrate some of the most pummeling beats and riffs that have that exquisite enjoyment to them. Similarly evident is “When The Ships Arrive”, “The Pillars Of Creation” & “Faith Is Gone”, where the lyricism and instrumentation is just fulfilling to the maximum. “Flee From Today”, “Shell Beach” & “Beyond The Realms Of Time”, individually implements an atmospheric balance of supreme fruition while making it the most heaviest record you'll listen to this year. Ending with “A Distant Knowledge” this band surely institutionalized themselves to create something immensely special. As a thrasher myself; it was easy for me to align an agreement with this act; “Back To Haunt” evolves with each listen and can only get better. If you are looking for that unprecedented discovery – look no further; POLTERGEIST will please all fans of Metal, as they should!